Collect SG50 gift bags while using Singlish to attack enemies! Oh... my favorite coffee and bread! Hey there! How's your weekend coming along? I'm back with a small update on Code Ordinal Rise! In the previous update, I added the Slime and showed how it bounces and chases you. To be honest, it is really interesting and fun to add behavior to monsters! And since the Slime bounces, I gave it the ability to bounce over short walls if doing so will allow it to reach you faster. And when it attacks you, you will now see a simple animation on your health bar (bottom left) to indicate how much damage you have taken. It is also possible for monsters (in this situation the Slime) to attack you from behind. And that is why I have also made it such that you'll know which direction you are under attack from! I have considered adding a knock-back effect when you get hit by a monster. However, doing so would make the Slime rather powerful for a starting monster. So I will be reserving that for a future monster with the ability to do so. And that's it for today's short update! Hope you liked it! 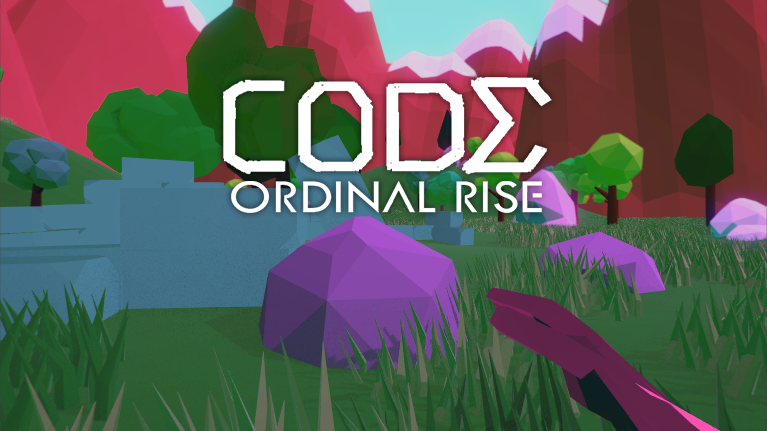 Be sure to check out Code Ordinal Rise's new Facebook and Instagram channel! Hey there! I'm back with a new update on Code Ordinal Rise! With Code Ordinal Rise, my plan is to have a huge variety of monsters so it will be interesting and fun to have different behaviors for them! And I do want the level of difficulty to scale properly so you won't get monsters that are too easy or monsters that are too hard all of a sudden. My idea for the Slime is to make it as slimy as possible. However, I do want it to have the "Hey I can bounce" look. So here's a preview of when it is just idling around. Turns out it was because there was a small gap in the areas the slimes were able to find a path for! And remember that I wanted them to bounce as well? So I made them bounce while chasing after me! In addition to bouncing and moving, I also added simple damaging via the noob axe! Here's some axe on slime action! To make it more interesting, I made it such that when your axe hits the slime, some small greeny particles will drop out of the slime. This is to give the impression that you are cutting down parts (albeit small) of the slime. I also did a little camera shaking effect (which I'm not satisfied with at the moment) so I might tweak that further down the road. That's about it for today's update! I will have to fix that bug where the slime gets stuck on top of rocks and walls and add "taking damage" to the game! Hello! I'm back with another update on Code Ordinal Rise! In additional to that, you might have noticed the new HUD at the bottom left corner. And I have also added a new crosshair that reacts and pulsates when you're jumping/walking and running. The reason for the pulsating of the dynamic crosshair is to make more sense when you're trying to aim while moving about. As such, the accuracy of ranged attacks will also go down when the crosshair pulsates to a bigger radius. Besides casting magic spells as a form of ranged attacks, you can't really have a survival game without some close combat or melee action. And that is why I have decided to go with showing 2 hands from your perspective. And that is the 1st noob weapon (the beginner axe) that you will find yourself using quite often. For example, I have created a few different axe swinging animations so that you will not see the same animation over and over again! I am currently starting on the 1st enemy that you'll encounter in Code Ordinal Rise so look forward to that! I'm back with another small update on Code Ordinal Rise! So I have finally added a simple HUD on the bottom left corner of the game! And towards that aspect, you will also spent mana when casting spells! If you do not have enough mana, puff! Your mana (MP) will also regenerate on its own and I do plan to add options in the game which will speed that up! As mentioned, it's a rather short update as well so that's it for today! Remember to find me on Twitter at http://twitter.com/WhiteSponge where I frequently tweet about the game! I have always been intrigued by magic and so with Code Ordinal Rise, there will be a lot of spell casting (of course you can choose other attack options)! And here is the 1st ever spell cast test! And as you can see, it still needs lots of improvement (e.g camera shake). Hello! My name is David and recently I was playing around with creating low poly objects for the first time and ended up starting this new game. Code Ordinal Rise will be an arena survival First-Person RPG where you have to survive waves and hordes of enemies coming at you. It sounds simple because it is. Anyhow, this is where I will post frequent updates of the game's progress! As of now, Code Ordinal Rise is 2 weeks in its development! You can also find me on Twitter at http://twitter.com/WhiteSponge where I frequently tweet about the game too! The new Facebook page is also up! Look forward to the game's progress as there will be a super early alpha demo coming in the next few months or so! Cheers! itch.io Community » Game Development » Devlogs · Posted in [Live On Steam] Stellar Stars - Multiplayer Online Roguelite Arena (MORA)! DevBlog! After months of hard work creating, collecting and hunting stars, we are really happy to announce that Stellar Stars 1.2: Rise Of Magic will be arriving this 3rd March in open beta! This means that you will be able to get your hands dirty hunting stars in this new adventure with new spells, gameplay improvements and a new character! Although there hasn't been any reveals for the new character yet, look forward to playing as her in the upcoming open beta on Steam! And since it will be an open beta, your feedback and voice will directly affect your star-hunting adventure! If you want to get a sneak peek at the new spells, you definitely should join the new Discord community! So mark the date (3.3.2017) on your calendar right now! It has been a long while since the last update and I apologize for that! So today I am back to share some good news! Not only Stellar Stars is now out on Steam, a new and exciting update has been announced! Announcing Stellar Stars 1.1: The Arrival Of Tink! This new update will arrive this coming 22.12.2016 just before Christmas! 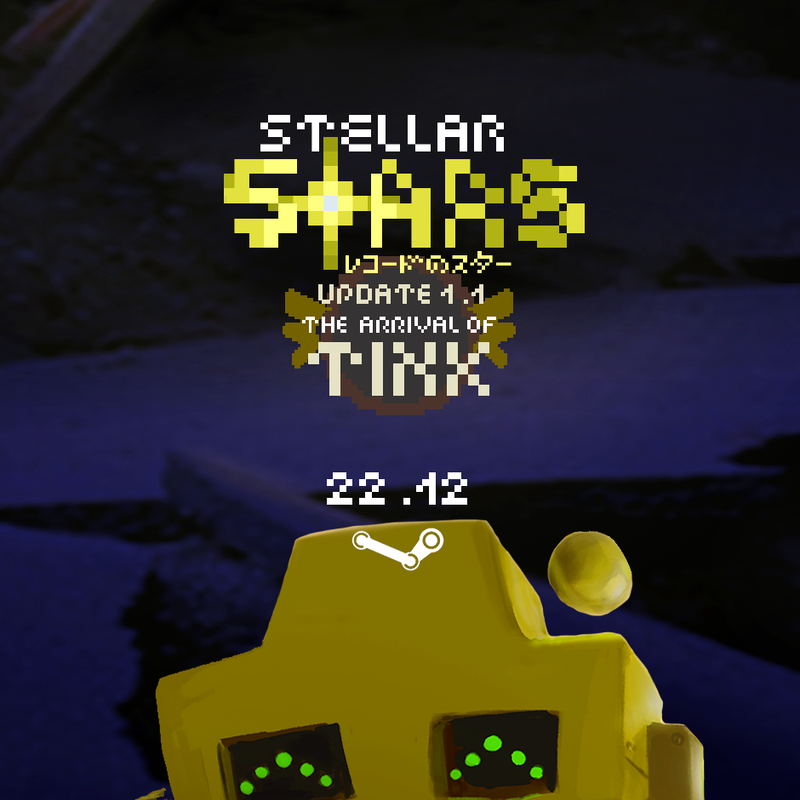 Stellar Stars 1.1: The Arrival Of Tink will feature the long-awaited 5th character Tink! We haven't revealed any new details about this new character, other than that it will be joining the Stellar Stars line-up! And if you didn't know, we live stream on TwitchTV the game development process of Stellar Stars! You can find us at http://twitch.tv/WhiteSponge and ask us anything you want! Last but not least, look forward to the teaser trailer for Stellar Stars 1.1: The Arrival Of Tink which will be coming soon as well! Hi there epicandy13. Believe it or not, I designed Beat (the name of the character) before I found out about Meat boy. And the only similarities with Meat Boy are the shape (square) and color (red), both of which can't be copyrighted. Beat's main theme is how he moves to the beat of music (hence the headphones that he is wearing). There is no intention to copy Meat boy nor was there any need to. You Don't Wanna Miss These Bug Fixes! Yes you heard it right - today's new patch fixes quite a few number of nasty bugs in Stellar Stars! So you really don't want to miss it!. For starters, there was a bug discovered by Phroxen (watcher of our TwitchTV channel) where jumping in the game wasn't responsive at times, especially after attacking. There was also a bug where it was possible for you to spam your basic attack downwards and shoot through a platform. This makes it possible for you to attack enemies from above a platform. And in my honest opinion, that takes the challenge away from the game. Before today's patch, it was also possible to spam both of your basic attack and spells at the same time. While that in itself seems fun, it also created a glitch where you can continuously spam spells without using any mana. In addition to bug fixes, you will now be able to see this after logging in. You can now finally catch the latest or upcoming news via the banner on the left! This is also where we will show information about any special game events. So what do you think about today's new patch for Stellar Stars? To find out about all the new changes and bug fixes, experience it yourself here! Cheers! What We Are Cooking - Spoilers Ahead! If you haven't heard, we are making a lot of changes to Stellar Stars, and it's all in the name of creating a better gameplay experience for you. As there will be spoilers, if you prefer to be surprised when you download the next and upcoming patch (which will be v0.130 Alpha), stop reading right away. Still here? Alright let's start! This is the 1st big change that you will notice when the game loads - a new login screen! What does this mean for you? You will essentially need to register an account to play the game. While we are fully aware that this comes as an additional barrier to the game, let's think about it from another perspective. Registering an account creates a higher level of commitment and game progress that you can bring with you anywhere you go. You just need a desktop computer with Stellar Stars in it. And after you have logged in, this is what you will most likely see. If you look at the above screenshot, you might notice that it is rather easy to scan through your account stats on the top edge of the screen. Starting from the left, you have your icon that presents your current league, your user name, number of trophies, star level (of your account), number of stars collected and lastly number of matches you have both won and lost. However, the animating arrow should capture your attention with ease. 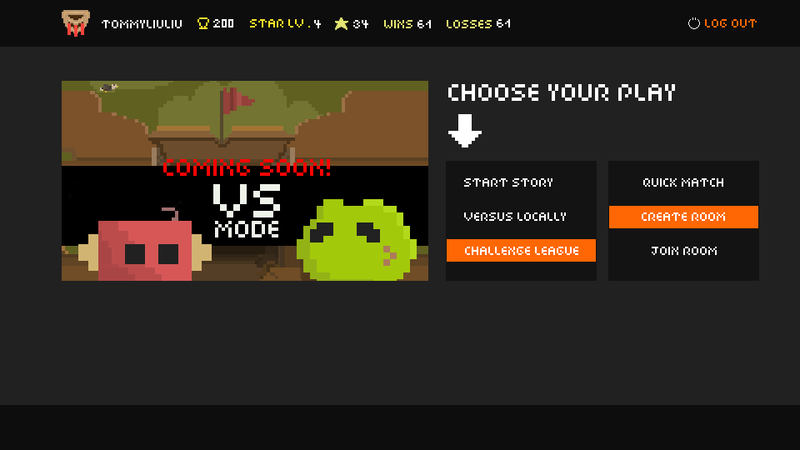 This is where you will be able to choose from the 3 game modes - namely story, local versus and online multiplayer matches. We are also in the middle of adding full controller support for Stellar Stars. This means that you will be able to play the game without even touching your keyboard or mouse. Big Picture on Steam anyone? And we have also created a virtual keyboard to empower your Xbox One controller and you in Stellar Stars! So what do you think of the upcoming new additions and changes to Stellar Stars? Let us know in the comments below! And if you haven't already, subscribe to the WhiteSponge mailing list to not miss any updates! Cheers! Introducing The New Score Board! Hello! Are you having a great day? 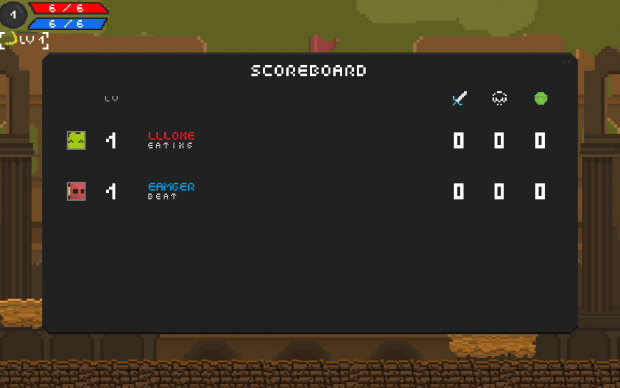 If you have been following our Twitter or TwitchTV channel, you might have seen preview screenshots of the new score board. However, with today's new patch (v0.129a), you can experience it for yourself! The new score board helps you access the current match with just a simple glance. For example, if any of the other players is currently dead, this is what you will see. The same goes for when any of the players are disconnected from the match. In addition to that, you can easily check out the character levels of the other players, the number of players you have killed, the number of times you have been killed and the number of minions you have slaughtered. You might have also noticed that there are icons in the middle of the new score board. Remember those character growths which you have chosen before starting the match? These icons represent the character growths that your character has just learnt from leveling up. To activate the new score board, simply press and hold onto your [TAB] key if you are using your keyboard. With an XBox One controller, you can use the map/select button (left of start) to activate it. 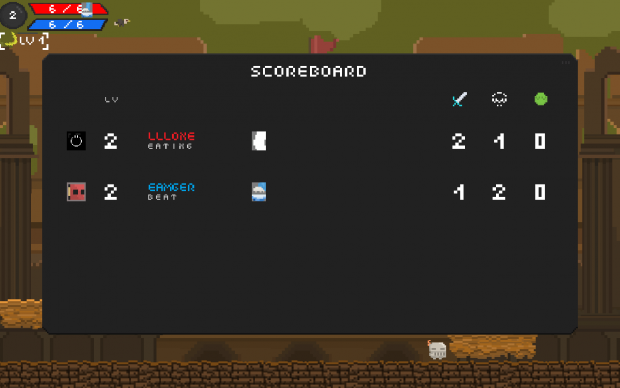 On top of the new score board, we have also added a few new animations to spice things up for you. 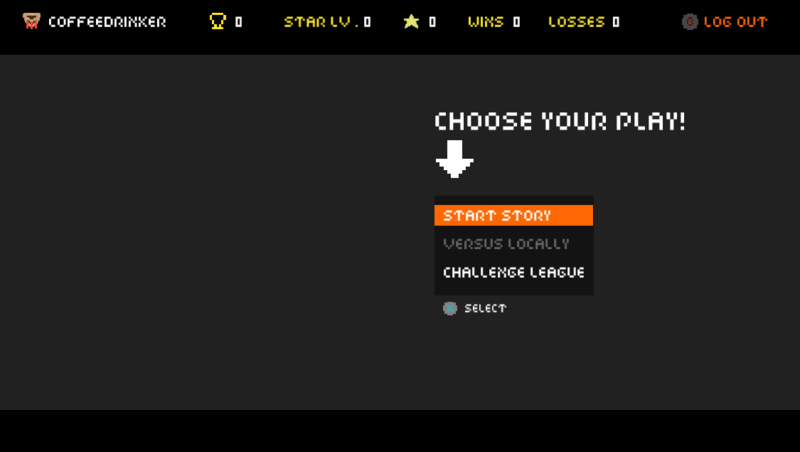 For example, when you start up Stellar Stars, this is what you will see now. And let's not forget about the bug fixes. Because without bugs, the gameplay experience would be awesome. So what do you think of today's new update? Let us know in the comments below! And if you haven't done so, be sure to subscribe to our mailing list to not miss any updates! Cheers! Hey there! David here again to share a piece of awesome news - Stellar Stars has been green-lit in just 17 days! On behalf of the WhiteSponge team, I would just like to thank you for helping Stellar Stars get green-lit! We would not be here without you and we would not have done it without you. We are definitely looking forward to going on this exciting new journey with you! So look forward to more updates from us! And if you haven't done so, follow our Twitter channel and subscribe to our mailing list so you won't miss any updates! I'm back after the New Year celebrations! And on behalf of the WhiteSponge team, I would like to wish you a very happy 2016! To kick things off, I would like to introduce you to something new today - the Gladiator's Arena! Before I spoil anything for you, check out the following video! Apart from being available only when you're playing in multiplayer matches, the Gladiator's Arena also spots a new enemy - the Warrior's Minion! The Warrior Minions come from different backgrounds. Some of them are prisoners of war who were captured and forced to fight for entertainment. Many others are slaves while the minority were born with the thirst for battle. Even with their different backgrounds, they have earned their body armor through surviving the odds and defeating others in battle. So while they seem defensive with their body armor, they can get aggressive if they sense your presence. So what do you think of the new Gladiator's Arena? Try it out and share your thoughts in the comments section! And lastly, don't forget to vote for Stellar Stars on Steam Greenlight (we are close to getting green-lit)! Cheers! Hey there! How was your Christmas? We have a small post-Christmas gift for you - a new patch for Stellar Stars! And today's new patch includes some new controls and new bug fixes! In today's patch, we have added new keyboard controls for you! You can now use WAD to move! If you are worried that you won't get used to the new keyboard controls, don't worry as they are just added as additional controls. The existing set of keyboard controls (as shown below) is still usable. And we have also added a little visual feedback to improve your gameplay experience. Remember when you get damaged by enemies? In today's patch, you will now flash red for a split second when that happens! While it is only for a split second, that will help you be aware of when you're getting hit! - Where In the story mode, getting stunned by the 1st Boss will sometimes cause you to stay rotated forever. So what do you think of today's new patch? Do try it out and let us know! Remember to vote for Stellar Stars to get it from Steam! Look forward to 2016! Cheers! itch.io Community » General » General Discussion · Replied to TangentFox in Pitch your game: "One line to lure them all"! 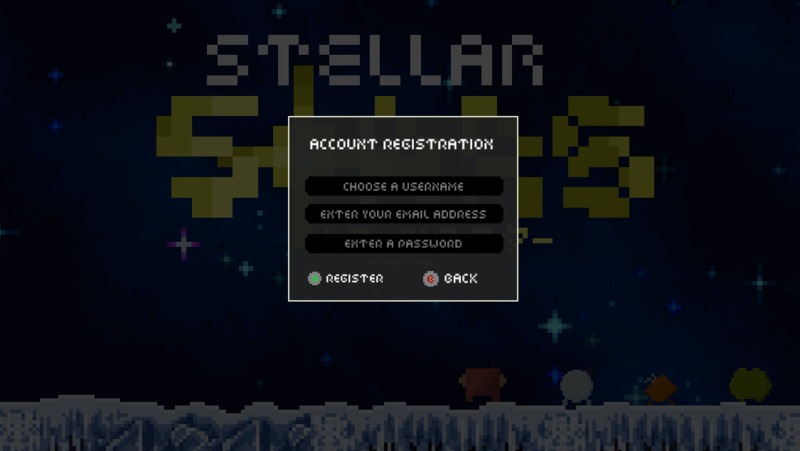 Stellar Stars is the 1st Ever Multiplayer Online Rogue-lite Arena (MORA) that passionately cooks the best of Multiplayer Online Battle Arenas (MOBAs) and Rogue-lites together, empowering you with the ability to level up in direct and interactive ways, while fighting other players in a sci-fi & fantasy 8-bit world with procedurally generated stages. itch.io Community » Game Development » Devlogs · Created a new topic [Live On Steam] Stellar Stars - Multiplayer Online Roguelite Arena (MORA)! DevBlog! Hey there! My name is David and I run @WhiteSponge. We are building a family of fun-loving game crafters to make the world a more fun place for you to live in! And the current game that we are crafting is Stellar Stars! Think of Stellar Stars as the love-child of MOBAs (Multiplayer Online Battle Arenas) and Rogue-lites. It cooks both of them in a passionate way so you can enjoy the best of both great genres. 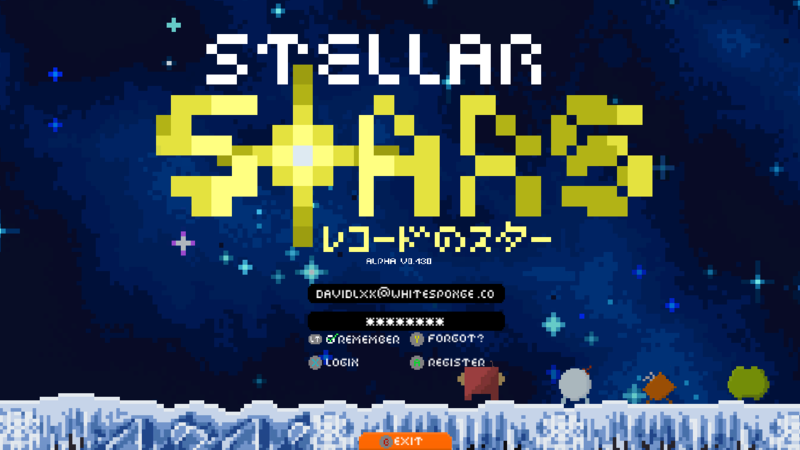 Stellar Stars is also now on Steam Greenlight! Do help to vote for it so that you can get it from Steam too! Challenge other players (4 max) in the fast-paced, competitive and procedurally generated arenas! Climb your way up the multiplayer leagues by grabbing trophies from winning matches! Leap higher! Sprint faster! Decide and choose from the many fun ways to progress your character when you level up! Play as different characters and unlock new characters as you progress through the game! Explore various worlds filled with unique enemies and overpowered bosses in the story mode! Experience the best gameplay with an Xbox One Controller! And this 1st post wouldn't be perfect without any screenshots! So here goes nothing! I will be using this as a dev blog for constant updates so you can also see the progress and changes we make to Stellar Stars! So what do you think? Any feedback or suggestions on what you see is greatly welcomed! And you can find us on Twitter, TwitchTV (yes we do regular live streaming!) and Facebook! 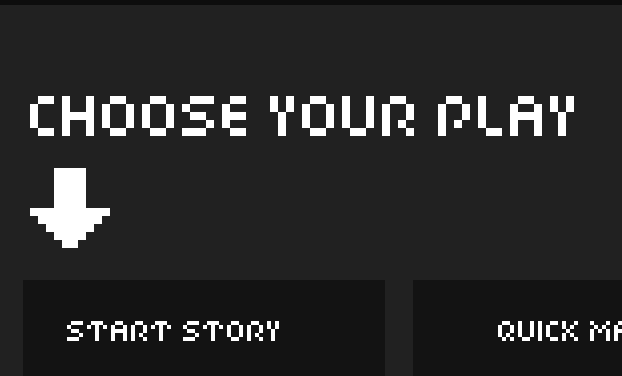 itch.io Community » Game Development » Release Announcements · Created a new topic An Invitation To You - Do you game? Hey there, my name is David and we're WhiteSponge. We're pretty new on the block and are based in Singapore on the western side of the island. It's here in a small office space that's surrounded by other game studios where we've lately been putting in everything that we have got into crafting games. We are a small team of 4 and a family of fun-loving game crafters. There is actually a special meaning to our name, WhiteSponge. White is the color you get when you combine all the colors together. A sponge is something that absorbs different stuff that you throw at it. So when you combine white and sponge, it means that anything is possible as long as you are open and willing to learn and accept new experiences. And that is what we stand for. So while it sounds crazy, our vision is to make the world a more fun place to live in through the games we craft. We have an open and transparent culture. Every day, we stream our game development process on [TwitchTV](http://twitch.tv/WhiteSponge) so that you can get to see how we craft games. You also get to interact with us live and see your feedback transformed into the game directly. And over the past 1 year or so, we have put in everything that we have got into our latest craft - Stellar Stars. With Stellar Stars, we want to create something different. We want to give you a different gameplay experience than what's out there. That's why we set out to craft Stellar Stars to take the best of 2 great genres - Multiplayer Online Battle Arenas (MOBAs) and Rogue-lites, and combine them into 1. We like to call Stellar Stars a Multiplayer Online Rogue-lite Arena (MORA) and we think that it has a nice ring to it. And that's why we would like to invite you to join us on this journey, to make the game even better by supporting it on our new crowdfunding campaign on [Indiegogo](https://www.indiegogo.com/projects/stellar-stars/x/8496561). And we know that being able to get the game from Steam means a lot to you. And that's also why we have just added the game onto Steam Greenlight at steam://url/CommunityFilePage/565632272. Crafting and improving the gameplay experience of Stellar Stars is always an ongoing process. And we would like to invite you to join us whenever, however you can. Your voice and feedback means a lot to us. In fact, some features or skills in the game are a direct result of live feedback on our TwitchTV channel! So the two links we'd like you to see are: 1. our Indiegogo campaign (https://www.indiegogo.com/projects/stellar-stars/x/8496561) and 2. our Steam Greenlight campaign (steam://url/CommunityFilePage/565632272). We hope you like the look of our team and of Stellar Stars and let us know what you think of the game if you try the demo. Thanks for reading and ask us anything in the comments!